A beacon is a small Bluetooth Low Energy (BLE) device which emits a constant Bluetooth signal. The beacon's signal setting is one of the most important deployment configurations in a live environment. It will highly affect the user experience, deployment cost and indoor positioning precision. This article gives a detailed introduction of signal performance indicators, the major signal related configurations, the factors to consider in common scenarios and how to measure beacon signal performance with a smart phone app. A beacon device has an omnidirectional antenna making its signal area spherical in shape. The actual beacon is at centre of sphere. A smart phone can detect the beacon inside the signal area. The diameter of the signal area is primarily decided by the beacon signal transmission power (Tx Power). Higher Tx Power equates to a longer diameter. Receive Signal Strength Indicator (RSSI): When a smart phone is in range of a beacon signal, the signal strength it receives from the beacon becomes lower when the distance from the beacon is further away. The signal strength is referred to as the Receive Signal Strength Indicator (RSSI), and is measured in dBm (ex: 4 dBm, -10 dBm). Higher dBm indicates higher signal strength. Distance Estimation: Based on the RSSI value, a smart phone app can calculate the distance from the Beacon. For example, if a Beacon’s broadcast range (the spherical diameter) is 15 meters, based on the measurement, we know that the RSSI is -50 dBm at a 1 meter distance and -70 at a 3 meter distance. With an RSSI reading of -60 dBm, as -50 > -60 > -70, it can be estimated that the distance between the smart phone and the beacon is between 1 and 3 meters. The RSSI-based distance calculation is not always accurate. 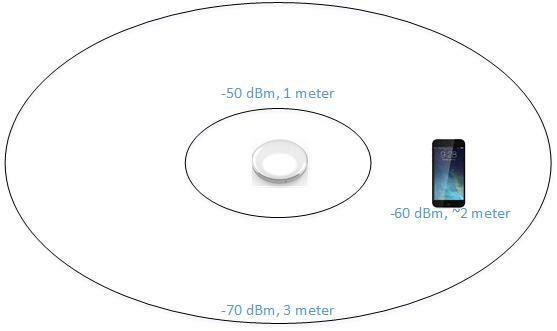 Bluetooth signal strength is easily effected by environmental factors such as water, which absorbs signal strength. On humid days, RSSI will be lower than on normal day even if distance between the smart phone and beacon device is identical. In addition to environmental factors, beacon configuration and beacon antenna performance can also affect signal stability. The Advertising Interval and Tx Power are two majors configurations that affect beacon signal performance. A beacon keeps its broadcast signal in Advertising Interval. A smart phone’s Bluetooth receiver will also monitor the beacon’s signal using special Listening Intervals (Note: this is a simplified explanation. The Bluetooth protocol’s signal detection is much more complex). When the beacon is sending a signal, if the smart phone is not "listening", the smart phone misses the beacon. If the beacon broadcast is more frequent, there is less Advertising Interval. There is less chance that the Smart Phone misses the beacon signal. If it misses many times, the smart phone app might “think” the beacon doesn’t exist. A smart phone's Bluetooth protocol stack may receive more broadcasts from same beacon. The smart phone's Bluetooth would then calibrate the signal strength based on multiple broadcast RSSI's, so the RSSI value will be more accurate. Consequently, less Advertising Interval leads to more stable Bluetooth Signal. However, it is not free, and will also lead to less battery life. Tx Power (Transmission Power) is the signal strength with which the beacon sends the signal. Higher Tx Power means a longer signal range. Picture #1 is an RSSI trend with a <100ms interval, 4 dBm Tx Power> and Picture #2 is an RSSI trend with a <100ms interval, -30 dBm Tx Power>. The beacon is 0.5 meters way from the smart phone. It is clear that less Tx Power leads to more stable RSSI. In order to achieve stable RSSI and higher precision indoor positioning, configure Tx Power as low as possible. In turn, less Tx power could also lead to less signal interference. Beacon signal quality and performance is heavily affected by antenna design. The beacon antenna is the most challenging on the part of the beacon’s PCB board design. In order to achieve good antenna performance, an antenna expert, good test environment, and test devices are needed. There are two major indicators used to measure beacon antenna design: signal strength and signal stability. Take the smart phone away from the two beacons and record the distance where the first beacon’s signal is missing. The distance recorded is the beacon’s signal range, where the beacon with highest signal range has a higher antenna performance per signal strength. In general, the beacon with the higher signal strength will also have a more stable signal. The following is an easy test to compare beacon signal stableness. It requires the Nordic (the chipset provider) company's nRF Master Controller, which can be downloaded from the Andriod play store. 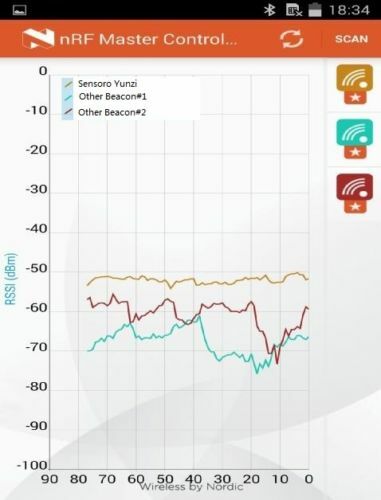 The following picture is the comparison of the Sensoro Yunzi with another two beacon devices from different providers. All three beacons are broadcasting at 0dbm and 416ms intervals. The smart phone is a Samsung S4 and distance is 1 meter. From the picture, we can see Sensoro Yunzi's signal strength and more stable than the other two Beacons. For the single beacon positioning, whenever a smart phone enters the beacon’s signal range, the smart phone can retrieve the Beacon’s ID (UUID/MajorID/MinorID) related content and show that to customer. For this scenario, one or a few (to avoid single point failure) beacons are deployed and the signal range is important. The Tx Power must be properly set to make sure the signal can cover the place but not exceed it. Less Tx power will not only save battery life, but also avoid interference with the beacon’s neighbors. For different beacon chipsets: There are different sets of Tx Power levels. For example, Ti CC2541 only has 3 level Tx Power levels (0 dBm, -6 dBm and -23 dBm), but Nordic 51822 has 8 Tx Power levels (4 dBm, 0 dBm, -4 dBm, -8 dBm, -12 dBm, -16 dBm, -20 dBm, -30 dBm). Nordic is better than Ti as it is more flexible in choosing proper signal range based on Tx Power. For this scenario, the Advertising Interval should be set at about 200 ms or 400 ms to balance between user experience and battery life. For the multiple beacon positioning: A smart phone will detect multiple beacon signals and find the position with triangle localization or fingerprint algorithm. In order to increase precision, the Advertising Interval is set to very low for example 100ms or 150ms; and the Tx Power is low too, for example <-20 dBm. As the Advertising Interval is low, choosing the right battery supply is also important to ensure enough battery life. Please refer to http://blog.sensoro.com/choose-right-battery-for-your-beacon/ for more details.